This is one of the amazing Panchatantra short stories for kids. Once upon a time in a jungle, there was a Mango tree and a Peepal tree. The Mango tree was warm-hearted like its fruits while Peepal tree was unsympathetic in nature. One day, the Queen of Honey Bees came to reside in that jungle with fellow bees. She noticed the Peepal tree which was very dense. She selected Peepal tree for making their nest. You may also like to read, The Oak Tree And The Reeds. Mango tree heard their conversation and said, “Brother, you have ample amount of space to give shed to anyone. Why don’t you do the same?” On hearing this, Peepal tree replied, “If you are feeling so much for them, why don’t you give shelter to them?” Hearing such a statement from Peepal tree, Mango tree said to the Queen of bees, “Sisters, you can create your nest in here. You will never have to face any problem.” The Queen and her fellow bees went within the Mango tree and created their nest. All of them thanked Mango tree for providing shed. One day, two carpenters wandered in the jungle to fetch some woods. They stopped on seeing the Mango tree and one of the carpenters said, “Wow! Such an amazing these woods are! We will get twice the normal price if we sell them in the market.” The fellow carpenter noticed the beehive. He then said, “This tree has a beehive. If we cut this tree, the Bees will not spare us. Let’s find some other tree.” Also, read The Bees And The Beetles. They saw Peepal tree and thought to cut the tree as it was denser. Both the carpenters then began to cut the tree. Peepal tree started crying as a result of pain and Mango tree heard his voice. Mango tree called out the Queen of the bees. The Mang tree then commanded Queen of bees to save Peepal tree. “We must help Peepal tree. It is in need of our help. Let’s go and do something,” ordered Queen of bees to the other bees. All the Honeybees marched together to Peepla tree and began to sting the carpenters. “Oh god! From where did these bees arrive? We last saw them on the Mango tree in their hive. How come they flew in here? Someone save us,” cried the first carpenter. “There is no time to talk. We must run! Otherwise, our lives will be in danger,” suggested the second carpenter. Both the carpenters ran away in a hurry to save themselves. Because of this, the Peepal tree got saved from getting cut. 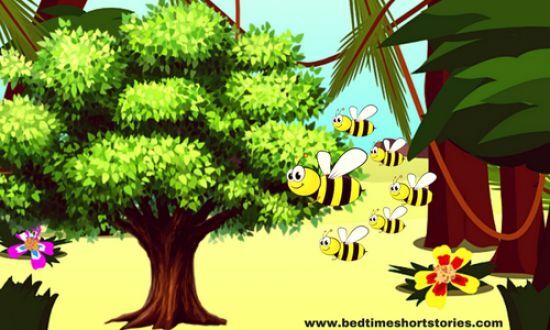 Peepal tree thanked the Queen of the bees for saving his life. Queen of the bees said to the Peepal tree, “If you really want to thank someone, then you must thank Mango tree. It inspired us to help you. He also said that it is not necessary to do bad things to people who did bad things to you!” You may also like to read, The Olive Tree And The Fig Tree. On hearing this, Peepal tree realized its mistake and apologized to the Queen of the bees and the Mango tree. The Mango tree accepted his apology and they again became friends. MORAL OF PANCHATANTRA SHORT STORIES FOR KIDS: WE MUST NEVER BE GREEDY AND SHOULD ALWAYS HELP OTHERS!